A specialty coating that solves numerous problems such as priming, stain- blocking, seal coating over fresh asphalt, oil spot sealing, black out paint etc. STAR GENESIS is a specialty coating that doubles as an effective PRIMER and SEALER for problematic pavement surfaces. It bonds tenaciously to surfaces contaminated by oil, grease, fuel, etc, as well as to polished, smooth aggregates in the pavement. 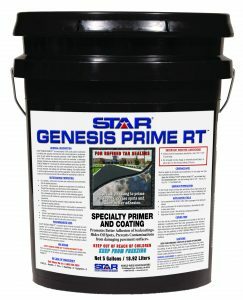 STAR GENESIS eliminates the need for extensive surface preparation. The oil and grease soaked pavements can be quickly coated with STAR GENESIS, with minimal scraping and washing. 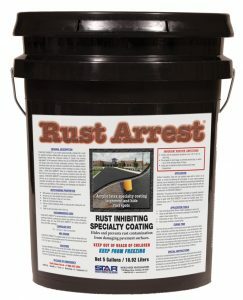 New specialty coating for rust spots and other problem areas..
Rust Arrest is the first and only product available that is specially formulated to actually rust proof and stop rust from bleeding through asphalt coatings over time. Eliminate those unsightly rust stains on asphalt with Rust Arrest. 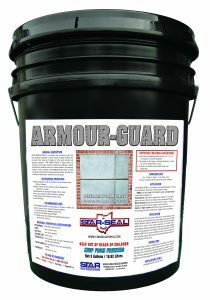 Clear, 100% Acrylic Latex, Fast Penetrating Sealer For Protecting Concrete, Brick, Masonry & Wood Substrates. Highly penetrating. It will not make the concrete surface look wet, shiny and slippery. Inhibits chloride de-icing chemicals, salt and damage from chemicals to concrete. Maintains flexural and tensile strength of the concrete. Very easy to apply. Very fluid, water-like consistency. Water-based, safe to handle and easy to store. Dries quickly; in about 20-30 minutes. Will stop oil from bleeding into the cured film of the seal coat. Will not disbond from the oil spot and will not allow the sealer to peel away from primed areas. Is water-based; ease in application, handling and clean-up. Very fast drying (3-4 minutes), 100% acrylic latex traffic paints with excellent brightness, hiding and fade resistance. Fast drying. Have been approved by various states. Excellent for night time application. Excellent durability and color retention. Excellent adhesion to glass beads. Bright highly visible lines with solid hiding power. Low toxicity, Low Volatile Organic Content (V.O.C.) per gallon. Low air pollution. Ease in application and clean-up, water – reducible. 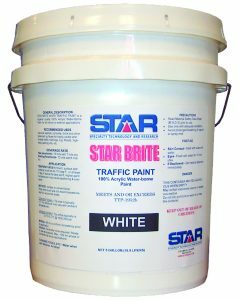 STAR SPECTRUM® is a 100% acrylic latex polymer based coating that belongs to a new generation of pavement maintenance products. Built on carefully selected polymers, color fast pigments, minerals, specialty additives and performance boosters, STAR SPECTRUM® has an extraordinary degree of toughness and water repellency. STAR SPECTRUM® forms a tough, durable and flexible coating that protects your pavement from the damaging elements of weather, water penetration and de-icing salts. 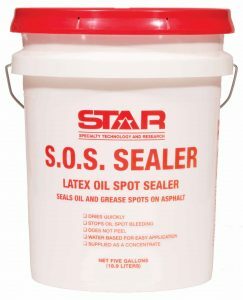 STAR SPECTRUM® also holds up well against occasional spills of gasoline, oils and many chemicals. STAR SPECTRUM® is a brilliant way to add vibrant color to any paved surface; for protection, safety, traffic separation and for corporate identity and visibility! Excellent Durability – STAR SPECTRUM® has been proven as a viable alternative to many traditional pavement coating products. Effective on both asphalt pavement and concrete surfaces. Superior Flexibility – Ability to bridge minor surface (non-working) cracks in the pavement to eliminate water penetration and extend the life of asphalt surfaces. Magnificent Color that Protects – Cures to a beautiful brilliant color that resists fading or weathering with time. Industry leading bright vibrant colors, a first of its kind. Non-Hazardous in Application, Handling and Storage – safe for playgrounds and use where human contact is unavoidable. Easy to apply, clean up and store. STAR SPECTRUM® COLORS; Lily White, Sky Blue, Ocean Blue, Purple, Sea Foam Green, Sage Green, Fairway Green, Lemon Yellow, Salmon Orange, Brick Red, Magenta, Peppermint Pink, Hot Rod Red, Tan, Cool Gray, Bike Lane Green and Black. The ability to mix custom colors is available.